The carpet in your store or office environment serves a number of purposes. And one of the least understood purposes of carpet is its ability to filter the pollutants out of the air and hold them in the carpet until it is vacuumed and or cleaned. This ability allows the carpet to assist in keeping the air that your employees breathe – as clean as it can be. What often happens is that vacuums that do not have proper filtration systems will re-introduce the contaminants back into the air as the carpet is vacuumed and secondly and most important – carpet is usually left too long between professional cleaning and it gets “full” – just like the filters on your furnace. Once this happens it can no longer hold the soil and contaminants inside its’ structure and as quick as more soil is introduced – it goes directly into the air when disturbed. Also – when this soil is left in the carpet it starts to grind away at the carpet structure – prematurely wearing out your large investment. When looking to get carpet cleaning done it is not usually necessary to do your entire facility. Often it can be treated as different traffic zones with the heaviest soiling zones getting the most attention. Everyone on your team will appreciate the cleaner environment. Studies have shown that there is less employee absenteeism caused by poor indoor air quality when carpeting and furnishings are regularly maintained. Our cleaning systems are state of the art, our team members are certified, uniformed, they are our employees, not sub-contractors and are all committed to this unique model of property maintenance. 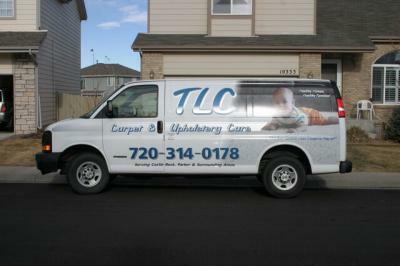 Call TLC Carpet Care Today: 720.314.0178 TLC Carpet Care proudly serves Castle Rock and all of Douglas County Areas.